I love bread. I’d happily eat it with every meal. However, I do get a bit bored of both making, and eating the same white loaf, all the time. Pitta breads make a nice change. I like them just in the normal sandwich bread replacement sense, and with dips, but my favourite pitta, is stuffed with ham and brie, and then grilled for a few minutes until the cheese melts. It’s absolutely gorgeous. Pittas are very easy to make. I think that really, once you have mastered the plain white bread recipe, you can do a lot with it, with just some tiny variations to the ingredients and cooking styles. The main things, for all of them, are making sure you knead well enough, and giving it enough time to rise. 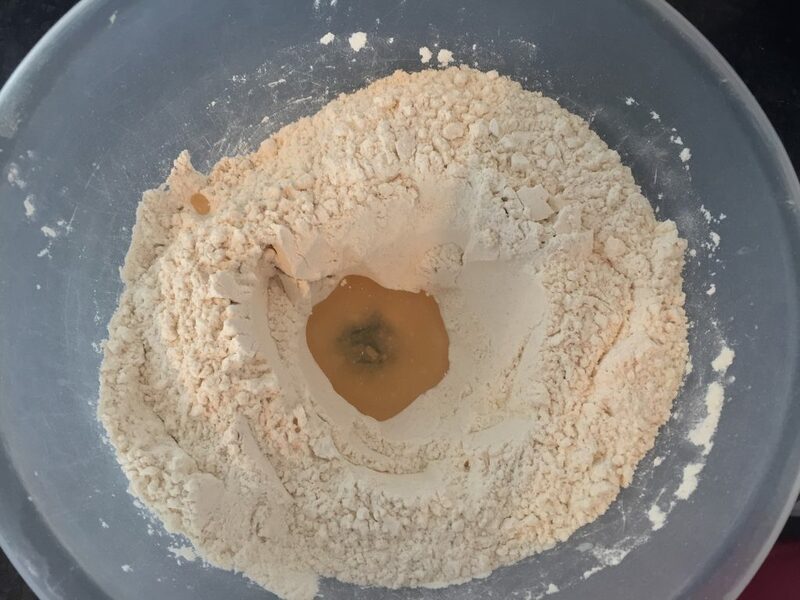 Firstly, put the flour, yeast and salt into a large mixing bowl, and stir together well. Then make a well in the centre. 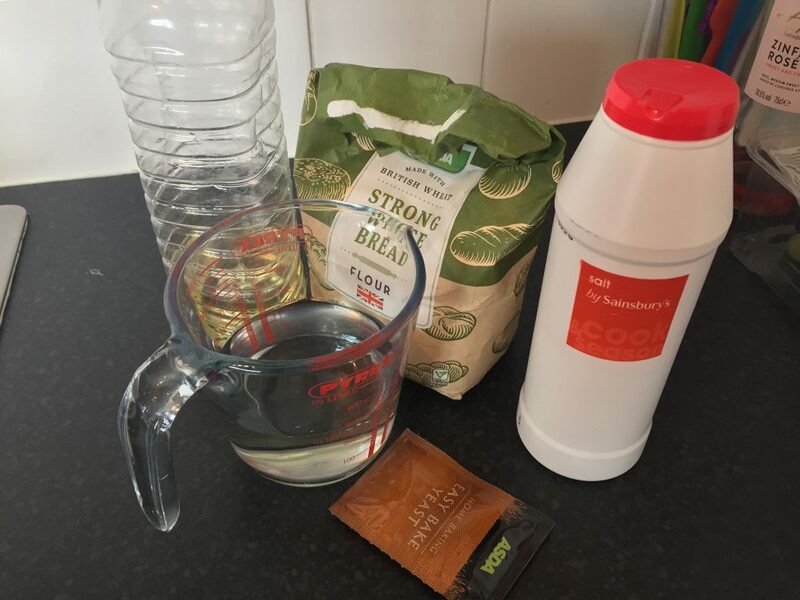 A lot of recipes I’ve read say you should now add the water a bit at a time. But, I cant be bothered with this, and could never understand how I was meant to keep making a well everything if the flour was wet and clumpy. So, I just don’t. Add the oil, and all of the water, to the well. If the well overflows, that’s fine! Stir in circular motions, from the outside, until it starts to form a ball of dough. Then tip out on to a lightly floured surface, and knead for 10 minutes. This is quite a firm dough, so you will have to put a bit of work into it, but keep going. 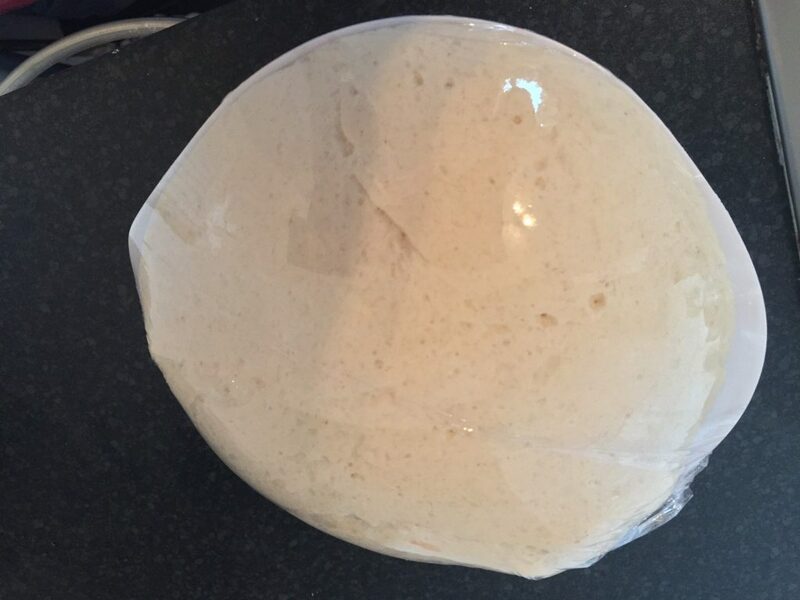 After 10 minutes, place the dough into a lightly oiled bowl, cover with cling film and leave for one hour, until it’s doubled in size. Make sure your bowl is large enough to cope with this growth, or you will end up with this. Once your hour is up, tip the dough out, and knead for a few minutes. Then, separate into 8 equal (ish) balls, place on a lightly floured surface, and press down slightly. Then, leave to rest for 10 minutes. Pre-heat the oven, and place 2 lightly oiled baking trays inside. 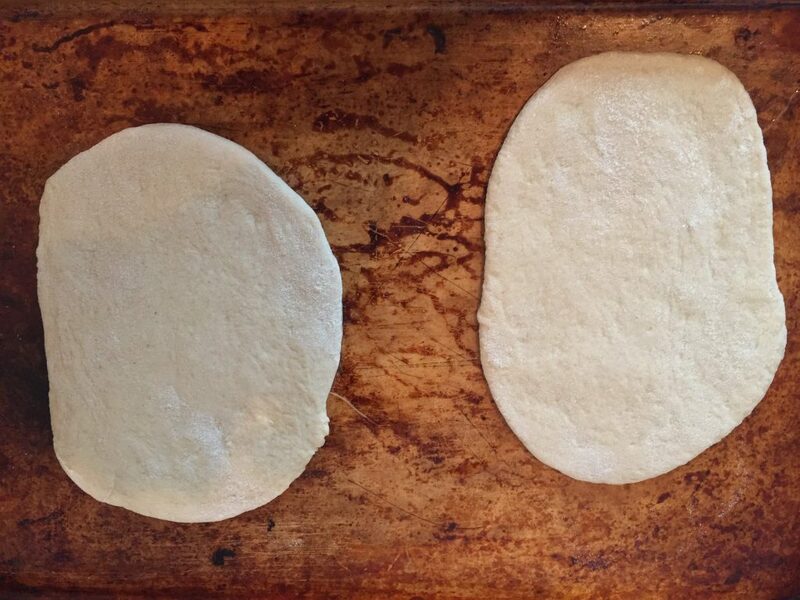 After 10 minutes, roll the pittas into a pitta shape, take the trays out of the oven, put the pittas on and return. I had to do 2 loads, as once I’d left a little space for rising, I could only fit 2 on a tray. Now, there are 2 things, that I’m awful at when it comes to baking. First, measuring, I don’t measure. Second, opening the oven, to see wants happening, every 2 minutes. These weaknesses, mean I can’t do cake. My cakes, just do not work. However, normally, with bread, it doesn’t matter too much. Once you’ve got the feel for it, measuring isn’t that important. And with the huge rise going on, a tiny door open won’t hurt. Not so much with pittas. While in the oven, they puff up massively, like balloons, this is what then gives you the pocket to fill when you slice them. This will not happen if you keep opening the oven. Do not open the oven!!! Bake for 12 minutes, or until golden brown, and puffed up. Remove from the oven, and leave on a cool surface. They will slowly deflate as they cool down. 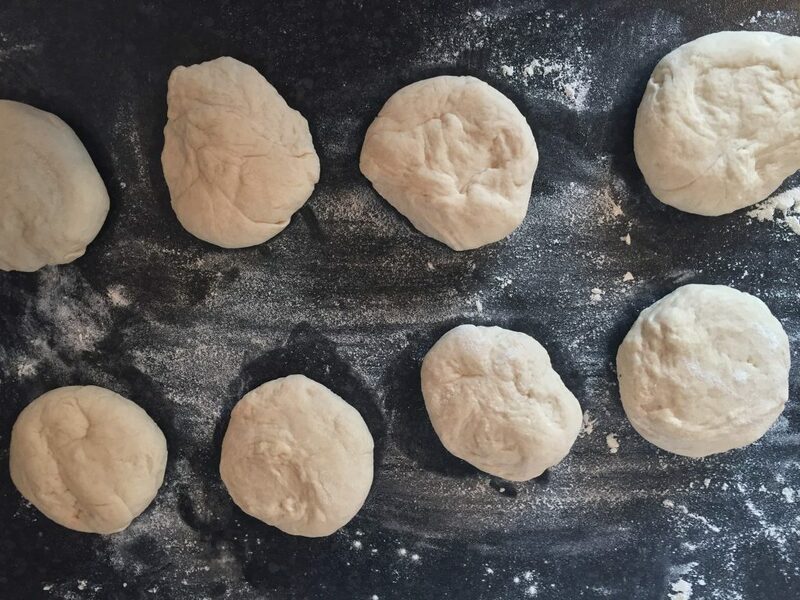 Homemade pitta breads make a great alternative to sandwiches!